Clinging to the edge of a sea cliff is a roofless ruin. 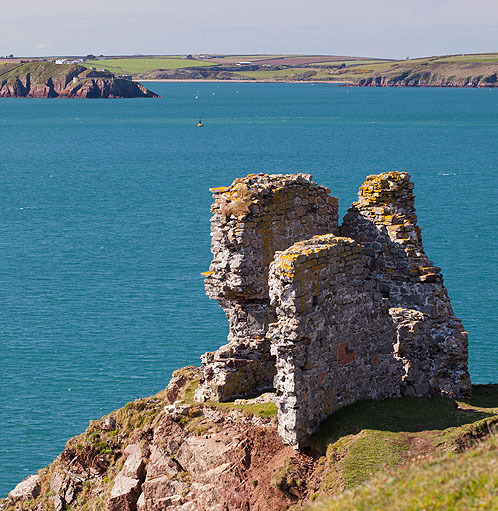 The East Blockhouse is one of a pair of Tudor artillery blockhouse built by instruction of Thomas Cromwell for King Henry VIII in the 16th century to guard Milford Haven. Henry VIII built a series of blockhouses and other defence towers around the coast of Britain, 1539-1545 , from the Thames Estuary to Milford Haven to counter an invasion threat from Catholic France and Spain. The fort at East Blockhouse is very small in contrast to some of the larger defences such as St Mawes Castle in Falmouth. The Tudor West Blockhouse , on the other side of the haven , was destroyed , when the existing 19th century fort was built.